Last night, finally, an achievement! I made pizza for what I believe is the first time on a pizza stone. On a heated pizza stone! God forbid any caloric art eludes me, you know? One of these days I will update you on my other new hobby, ice cream. For now, about this pizza, I made it late last night. Actually I made two. The other one is visible in the upper left, a corner of it anyway. That other pizza baked on a cookie sheet. But as I lifted the dough up off of the counter I realized, it all stayed pretty much in one piece and it was not sticking. Maybe .. maybe ... just maybe I could roll out the next one and slap it onto that stone. I almost said forget it. The pizza stone lives on the bottom shelf of the oven and it was searing hot, the way it was supposed to be. To take a pot holder and heft this heavy hot thing out of the oven and slap dough on it -- aiiieeee. I had never seriously considered it. 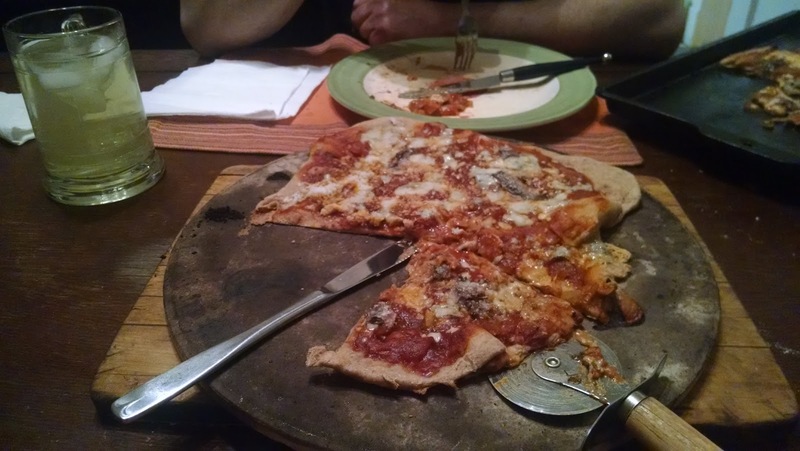 The only reason I even had the pizza stone was that I picked it up at a garage sale at some point. Pizza stones are a hot garage sale item because they are big and heavy and no one actually uses them. ... and neither am I. Out came the stone. Slap went the pizza. The circle became a little misshapen, and once it is on that stone, that is it, do not try straightening it out. What the heck, it added to the Martha Stewart charm. Back it went into the oven. Slam went the oven door. I did it! I did it! And it came out great, crisp in a way the cookie sheet pizza, while yummy, was not. This was a thin-crust pizza. One important thing, it incorporated the Gorgonzola cheese from Dorothy. I am going to call her today and tell her thank you! My father died a million years ago but that does not mean I do not celebrate Father's Day. Au contraire! We had a new Father today saying our Mass at St. Anthony's. He is from Tanzania and we are very happy to have him. There were many whispers about can we make this permanent and will we have to share him with anyone else. 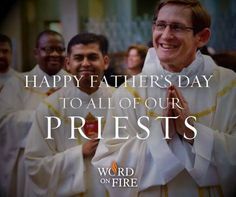 The priest's name is Father Justus, followed by a long African last name that I cannot pronounce let alone spell. So we call him Father Justus. Father Justus said the Low Mass, not the High Mass as we are used to but it was beautiful in a different way. The Low Mass is kind of cool because there are long periods of time where nobody says anything audibly and if anyone poked his head into the church to check it out, he would think we were all crazy. I enjoy that intense atmosphere. It is most mysterious! At coffee hour after Mass, everyone was fussing over Father Justus and bringing him the most choice items from the buffet which, we pride ourselves at St. Anthony's on our irresistible food. It was determined that Father Justus liked tea better than coffee and there was a whispered conference among parishioners about how could we not have tea, how could we be so stupid, we have to remember to have tea hereafter. Meanwhile he was brought chili and a cupcake swirled high with chocolate frosting. Father Justus sat down and blessed himself and said a little prayer and then ate the cupcake slowly, seriously and very neatly. In coming weeks I will have to fill him in on the way our dear departed friend Andy Jones taught us to eat cupcakes. You saw the cupcake in half and then eat it like a sandwich with the frosting in the middle. A very few people are in on that secret but soon Father Justus will be. It is funny, at the coffee hour I realized I was deciphering not only Father Justus' African accent but also my friend Steve's Croatian accent and, of course, Dorothy's Italian Alpine accent. Father Justus and I did share one sort of emotional moment about that. I said, Father, it is the way it is in the Gospel, people from all tribes and all parts of the world, all speaking the same language, Latin. And he agreed and we had a kind of meeting of the minds. When he got up from the table Father Justus made the Sign of the Cross again.It was hard for him to leave because nobody wanted to let him go. Next time I will take a picture. I did not want to freak him out by taking his picture today because everyone was jumping all over him. After that I went to Dorothy's house because she had bought a wheel of Gorgonzola cheese and offered to give me some which was so nice of her. I love going to a church where people buy whole wheels of cheese. But that is another story for another day. Then I went home and listened to the Monks of Norcia and ate Gorgonzola cheese and drank Bengal Spice tea and did Leonard Pennario editing while the cat napped nearby. As I have confided, I love to play the game of packing lunch. You have to eat anyway, you know? You may as well have fun with it. I have discovered packing lunches in canning jars. This is a fad that is all over the place and I have seen it before but somehow I never thought about trying it out. Perhaps it was the Bosch dischwascher that made me want to try it. The Bosch gets the jars all sparkly with minimal effort on my part. It will only be about 1,000 lunches before the Bosch pays for itself! But meanwhile I am having fun. There is a science to doing salads in Mason jars. 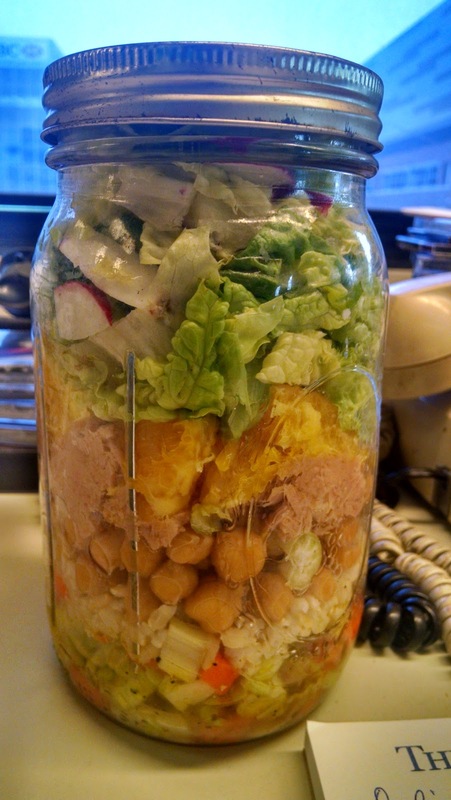 You start with the dressing in the bottom of a quart jar. Then you add the hard vegetables that will not soak up the dressing. Cut-up carrots, cucumbers and celery are good at this point. After that you may add rice or beans and chickpeas. And after that, chicken or tuna or tofu. And after that you pack in all this lettuce and then maybe one other thing on top of that -- toasted walnuts mayhap -- and then you screw on that lid after packing in as much lettuce as you can. Then at lunch time you pour it all out into a big bowl. And the lettuce is on the bottom and everything else tossed in nicely with the dressing on top. Genius! And it is pretty like '70s sand art. 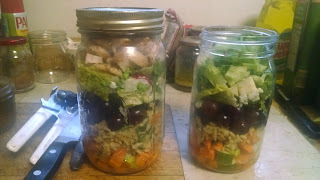 I started out with a salad of carrots, cucumber, then brown rice, red grapes, chicken, greens and toasted walnuts. I made one for Howard too and it took me about five minutes. And looked mighty fancy! The next day was Friday and we switched to tuna. I created an, ahem, Tuscan tuna salad with radishes and white beans and strawberries. I think I topped this with crumbled blue cheese. 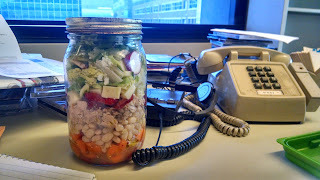 I am the Leonard Pennario of jar salad creators, expanding my repertoire daily and drawing from a variety of cultures. 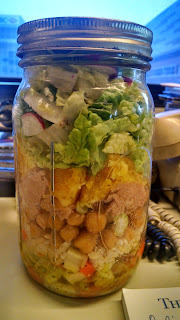 Today I created a masterpiece, a Food and Wine tuna, chickpea, and orange salad in a jar. Well, I subbed celery for fennel. You know me and fennel. That is the salad at the top of this post. I am an artist! And the great thing is, these salads fill you up. For some reason last week I was packing too little food for myself and I was running around hungry and eating chocolate and doughnuts when they were offered me. No more! Now I am fed. It is thrilling that Lou Michel, my colleague at The Buffalo News, is on CNN discussing that spectacular prison break that happened at Clinton Correctional Facility. Yesterday parallels were being drawn here and there to the movie "The Shawshank Redemption." Not to say anyone is admiring these murderers who made their escape. We are not admiring them! Nobody is. It is just that the intricate escape makes you think of other intricate escapes. It seems the right time to revisit the greatest scene from "The Shawshank Redemption," where the entire prison is all of a sudden mysteriously listening to Mozart. SO beautiful! To tell you the truth it is all I remember specifically about "The Shawshank Redemption" other than that Morgan Freeman has my birthday. The music they are listening to is the Letter Duet from Mozart's "The Marriage of Figaro." Nickel City Opera is doing "The Marriage of Figaro" in a couple of weeks -- on June 26 and 28 -- and I cannot wait. What a magical opera. Here is the great Kiri Te Kanawa singing the Letter Duet with the great Ileana Cortrubas so you can see what it is about. The Countess is dictating a letter. Well, they are collaborating on what is going to go into this letter and that is why their voices are weaving and intertwining this way and that. Mozart could always put life into music! There is another YouTube clip with Renee Fleming but whoever posted the video cut it off too abruptly at the end and ruined it. On this Web log everything leads back to Leonard Pennario. 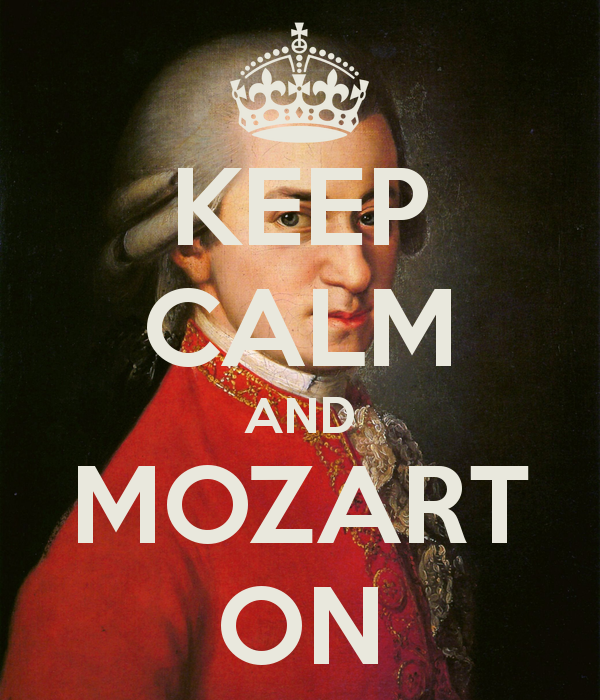 In the bigger world, everything leads back to Mozart! Today I went to the gym where I rode the elliptical machine and watched "A Bill of Divorcement." YouTube gave me a choice of one from 1940 and one from 1932. I went for 1932. And it absorbed me from the word go. Plus it is only an hour and six minutes long. A great gym movie. 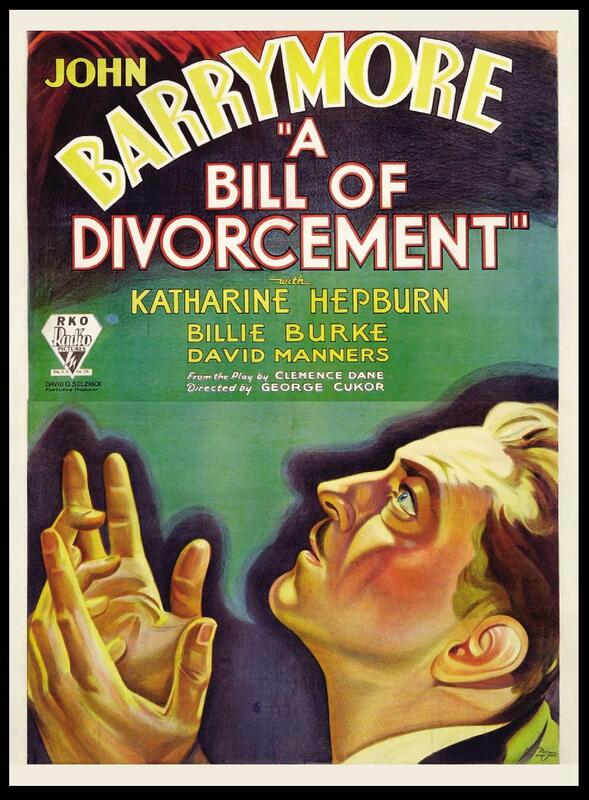 I knew next to little about "A Bill of Divorcement," and that is the way I like it. Yesterday I started watching this Joseph Cotten movie "Love Letters." It seemed interesting but first this guy from Turner Classic Movies got on and introduced it. And he told too much! I think there is this egghead attitude that knowing the plot shouldn't spoil it for you, you are above that, you can appreciate the artistry. But I do not want to know what is going to happen! I do not even want to know the first thing! So that annoyed me, that this guy just told me too much. Plus I had just watched "Portrait of Jennie" on my last two trips to the gym. The gym has sure gotten interesting these days! But I think I was getting a little tired of dour Joseph Cotten. On the other hand, he was great friends with Leonard Pennario and I love him for that, plus let's admit it, Joseph Cotten is handsome as hell, so I was going to see "Love Letters" through. But for some reason today YouTube froze up on the video and would not let me continue watching it. In effect it gave the movie the hook for me. Hence, "A Bill of Divorcement." 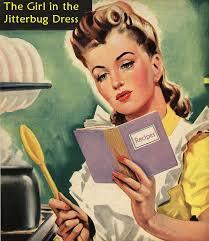 I divorced myself from "Love Letters"! 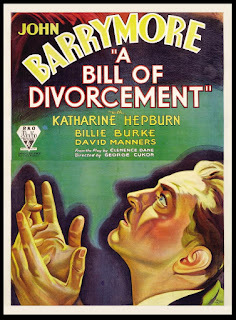 "A Bill of Divorcement" was pretty good. It stars a very young Katherine Hepburn, or as Pennario called her, Katie Hepburn. She looks wonderful, with beautiful gowns that fit her perfectly. And John Barrymore is in it too. The music is by the great Max Steiner, who wrote the music for "Gone With the Wind." I got the feeling as it went on that the movie was based on a play. It just had that feeling. That is all I will say, just in case anyone else wants to watch it and does not want it spoiled. If anyone watches it, let me know what you think. I feel as I am in a movie club with myself! Wow, you blink and all of a sudden you have not written in a week! Then it gets difficult to start writing again because you think you have to have something earth-shattering to warrant breaking your silence. I must change my habits. I hate being in this situation! So here goes, again. We continue to explore the potential of the pork chop. Tops had a special last week, $1.99 per pound for a huge boneless pork loin. You buy the pork loin and then chop it up into chops and freeze some, is my strategy. Last night before the Buffalo Philharmonic Orchestra we had pork chops with orange and fennel, interesting because I did not have fennel. However I have learned how to sub. You can use celery and some fennel seed. We do not grow fennel in our neck of the woods so why does everyone keep calling for it? Fie. Plus I happen to think fennel is overrated even though Pennario would be mad at me for saying so because he was so Italian. 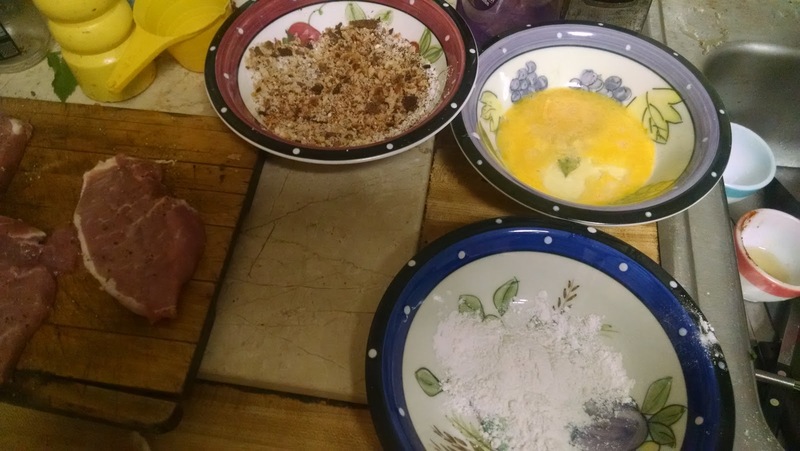 Tonight, speaking of Italian, it is Pork Chops Milanese. I have everything ready in shallow bowls. There is the flour in the foreground, then the beaten egg behind it, and the bread crumbs mixed with Parmesan cheese. Wish me luck! I will report how it goes. The Pork Project is rolling again. And so is the Web log!